So far MScherzer has created 79 entries. We added a clause about GDPR* compliance setting forth our respective obligations under this regulation to our Terms and Conditions Agreement (the “Agreement”), which now – unless superseded by another agreement – governs SI’s provision of background screening reports (“Reports”). The Agreement can be accessed here and is applicable to all Reports ordered from SI on or after May 25, 2018 (“Effective Date”). We posted a “GDPR Notice” on our website, which informs EEA individuals of their rights in connection with their personal data. There is no need for you to take any action. By continuing to interact with SI and using our services after the Effective Date, you agree to these terms. Of course, you can opt out at any time, by contacting Joann Gold, Executive Vice President/Chief Compliance Officer, at jgold@scherzer.com. *“GDPR” means Regulation 2016/679 of the European Parliament and of the Council of the European Union, and the European Commission of April 27, 2016, on the protection of natural persons with regard to the processing of Personal Data and on the free movement of such data, known as the General Data Protection Regulation. As a general principle, employers are legally permitted to monitor their employees online during business hours. Keeping a close eye on workers can help maintain company confidentiality, limit workers from surfing the web on company time and ensure the prevention of harassment. But such monitoring does come with caveats, as well as risks. For example, screening employee email on the employer’s network may be permissible but may require advance notice. In states such as Connecticut and Delaware, laws are in place that require employers to provide prior notice before electronically monitoring employees. A union contract may also place certain limits on monitoring and public-sector employees may have some rights under the Fourth Amendment with regard to unreasonable search and seizure. Federal law can also come into play. Although the Electronic Communications Privacy Act (ECPA) generally prohibits the monitoring of electronic communications, it contains a “business purpose exception” that permits employers to monitor the electronic communications of workers if the company has a “legitimate business purpose.” The statute also allows monitoring with consent and many companies do this by including such permission as part of the onboarding process for new employees before granting access to the company’s networks or systems. Another wrinkle: third-party communications. States such as California and Illinois mandate that all parties to a communication provide consent to its interception in transit. For employers, that means providing notice to recipients of employee emails and obtaining their consent before scanning a message from a friend or third party. Many companies post a notice on the company’s website and/or include a statement in employee emails that all messages are subject to monitoring and any response implies consent with the employer’s practices. Even with all these issues, monitoring emails may be more straightforward than focusing on employee social media accounts. The Stored Communications Act (SCA) addresses the situation of accessing electronic communications stored by a provider (such as Gmail or Microsoft), as distinct from an employer accessing emails on its own system. Under the SCA, employers can be liable for the unauthorized access and disclosure of electronic communications in storage on corporate servers of a provider. Further, roughly half the states ban employers from either requiring or requesting a worker to verify a personal online account like a Facebook profile, blog or Instagram or to log on to their social media account. While technology is available for employers to get around these laws (using keystroke logging software, for example, or taking screenshots), some of the information being monitored by an employer could itself be protected – such as union organizing activities under the National Labor Relations Act, attorney-client communications or in some states, geolocation data. Mobile devices add another layer to the analysis. For workers using employer-provided mobile phones or devices, the employer has the right to legally monitor use from contact lists to photos and videos to Internet visits and emails. As for bring-your-own-device (BYOD) situations, the terms are generally dictated by the employer’s BYOD policy, but this is an emerging area of law and therefore murky. All of these legal considerations are centered in the United States. Companies that operate outside the U.S. borders will have international law to contend with as well, notably the European Union General Data Protection Regulation (GDPR) and regulations found in its member states. As a general matter, EU law and the GDPR offer employees a greater level of privacy than that found in the United States. Last year, the EU’s highest court did rule that companies can monitor employee email – if workers are notified in advance. Perhaps most importantly, employers should recognize that like all things related to technology, the legalities of monitoring employees online are constantly evolving. Being able to adapt to changing laws, regulation and technology will keep employers on their toes. One of the hottest trends in employment in recent years has been the passage of “ban-the-box” and salary inquiry prohibitions in states and cities across the country. Limitations on salary inquiry have popped up in recent years as part of the legislative fight against wage discrimination and the gender pay gap. Proponents of such prohibitions argue that salary history questions feed into the discrepancy between what male and female employees are paid by continuously repeating history. Currently, California, Delaware, Massachusetts, Oregon and Puerto Rico have banned inquiries about prior salary, as have cities including New Orleans, New York, and Philadelphia, with dozens of other states and local governments considering such measures. The colloquial term “ban-the-box” refers to a box that applicants check to indicate they have a criminal record on standardized application forms. About 20 states and more than 150 local entities have already enacted legislation addressing inquiries into criminal history. The trend even went federal in 2015 with the Fair Chance Act introduced in Congress. Although the measure did not pass, it demonstrated the popularity of the movement. The proposed federal legislation also shined a light on the situation facing multistate employers, with different laws in different states and in some situations, different laws in different cities or municipalities within the same state. One law may contain an outright ban on inquiries into salary or criminal history while another may place restrictions on the timing of the questions. Some laws define covered employers to include businesses with five or more, employees; another may not apply its limitations to employers with less than 50 workers. As an example, although the state already limited employers’ ability to ask job applicants about any juvenile court matters, the California legislature broadened its ban-the-box protections for employees with a new law in 2017. Employers in the state are restricted from making hiring decisions based on an applicant’s convictions records and forbidden from considering conviction history until a conditional offer of employment has been extended. If an employer elects not to hire an applicant because of a prior conviction, the employer is required to conduct an individualized assessment to determine whether the history has a “direct and adverse relationship” with the job duties that justifies denial of the position. Written notice must be provided to an applicant that his/her conviction history has disqualified the applicant from employment, along with five days to respond and dispute the decision. A second notice must be provided with the final decision not to hire. In contrast, Vermont’s ban-the-box measure takes a different approach, allowing employers to question applicants about their criminal records during the job interview, albeit providing an applicant with the opportunity to explain their record. And under New York City’s law, an employer commits a per se violation of the statute by using recruiting materials of any kind (including advertisements, solicitations or applications) that express, directly or indirectly, any limitation or specification regarding criminal history. While the overarching principle remains consistent, the details of the laws vary from jurisdiction to jurisdiction. For multi-state employers, coping with such a patchwork of legal requirements poses a serious challenge. As the number of state and local jurisdictions with laws addressing salary inquiries or criminal history continues to expand, multi-state employers should brace themselves for a giant compliance puzzle – and consider getting help from an expert. And it can happen to your business. Criminals do not discriminate – any type of business or organization of any size or legal structure including sole proprietorships, partnerships, LLCs, trusts, non-profits, municipalities and county governments, school districts and corporations are all targets for business identity theft. What exactly is business identity theft? First, let’s clarify that we are not talking about an information security breach or an incident involving the loss or theft of confidential consumer information. Rather, business identity theft discussed here involves the actual impersonation of the business itself. It happens when criminals pose as owners, officers or employees of a business in order to get their hands on cash, credit or loans, leaving the business on the hook to deal with the debt. A favorite tactic of identity thieves involves the theft of the tax identification number (TIN) or employer identification number (EIN) of the company or the owners’ personal information to use that data to open new lines of credit or obtain a business loan based on the company’s identity. Another common form of business identity theft occurs when criminals file fake documents with the Secretary of State’s office to change company information such as its registered address or the names of directors, officers or managers. Once the records have been changed, the identity thieves can establish lines of credit or new accounts with the false information. Other examples of the fraudulent use of a company’s information include current or former employees making use of their access to financial documentation; establishing a temporary office space or merchant accounts in a company’s name; going through a business’s trash and recycling bins to find account numbers or other sensitive data; using phishing attacks or other scams to get the business’s banking or credit information from employees; and filing for tax credits with stolen EINs. Businesses are an attractive target for identity thieves. Generally speaking, a company will have higher credit limits than an individual, so opening a new account or line of credit in a business’s name will yield more cash for a criminal and larger purchases will receive less scrutiny. Perhaps most frustrating, companies are required by law to report certain identifiers (an address, EIN/TIN, and names of directors in most states), meaning the information is publicly available and easily accessible to anyone. The invoicing and payment terms typically available to businesses can also work against them. Identity thieves may have a window of up to 30 days after a purchase to disappear before a company detects a problem – and even longer if the thieves use a different address. Unfortunately, business identity theft is an underreported crime for a variety of reasons. Companies often have no idea their identity has been compromised until they begin receiving unfamiliar bills and collection notices when it is already too late to stop the thieves. Government agencies receive frequent requests for changes to company information and an address change is unlikely to raise red flags. Some businesses aren’t paying close enough attention or fail to caution employees about the possibility of phishing scams, while others may be embarrassed or concerned about their reputation with customers and don’t want to report what happened. Given the underreporting problem, statistics on business identity theft can be hard to come by. However, the Internal Revenue Service (IRS) said it has seen the number of corporate tax returns flagged for potential business identity theft increase exponentially in recent years, from 350 in 2015 to 4,000 in 2016 with a jump to 10,000 in only the first six months of 2017. The cost of the damage has also risen dramatically, from $122 million in 2015 to $268 million the following year and $137 million for just the first half of 2017. Importantly, these numbers reflect just one of the many forms of business identity scams. What can companies do to protect themselves? Click here for a checklist of the most important steps for prevention and what to do if your business becomes a victim. We jingled all the way to the finish line and surpassed our fundraising goal! With everyone’s efforts we were able to raise $3,284 and had 26 members go out and walk/run! The morning was full of laughs and some amazing sing-along moments led by Larry Scherzer himself! We ended the race hand-in-hand singing “Ain’t No Mountain High Enough”. We had a couple of team members who placed in their division! We are already thinking about next year’s run! How does a Scherzer International marching band sound? …You will not want to miss that! With your donation we are helping conquer everyday battles for one in five adults and 300,000 children with arthritis and related diseases. The Best Deal Out There! It is #GIVINGTUESDAY ” the Tuesday following Thanksgiving and Black Friday and Cyber Monday, a global day of giving fueled by the power of social media and collaboration.” Take part and give back to your community. Scherzer International would like to invite you to participate in #GIVINGTUESDAY by signing up to be a part of the Scherzer International team. On Sunday, December 10, 2017 at 8 a.m. at Glendale Central Park meet us at the starting line and walk – maybe run – a 5K like no other. Wear your “ugly” holiday sweater, put some jingle bells on your shoes, and enjoy some breakfast goodies at the finish line. Follow this link and join us in finding a cure for America’s leading cause of disability. For those who cannot attend the race you can “Jingle in Your Jammies” Choose this option and for $30 you receive a shirt and fundraise for a cure! All donations, big or small, make a difference. Thank you! Arthritis is a serious and growing health crisis – impacting one in every five adults and an estimated 300,000 children. It’s America’s #1 cause of disability. The Arthritis Foundation’s Annual Jingle Bell Run aims to change those numbers. At Scherzer International we are continuing our efforts to raise funds for those affected by Arthritis. This past Thursday, November 16, we had our first fundraiser for the 2017 Jingle Bell Run at The Stand. SI employees, their families and friends made their way over to The Stand and enjoyed some delicious items. From every purchase, 20% of the proceeds went to support SI’s fundraising goal which aims to raise funds and awareness for Arthritis. Thank you to The Stand Northridge and Woodland Hills location for the wonderful food and for supporting local community fundraiser’s like ours. Everyone’s efforts are greatly appreciated. Thank you to anyone who has donated or maybe shared a social media post. If you would like to see us reach our fundraising goal and get a head start on your New Year’s Resolution by participating in The Jingle Bell Run just click here! Jingle all the way with Scherzer! 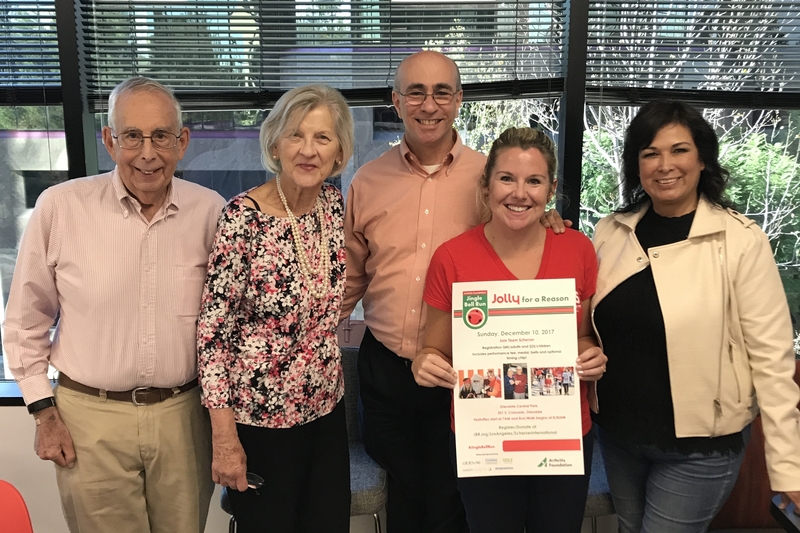 Scherzer International is excited to announce our participation in the Arthritis Foundation’s 2017 Jingle Bell Run! We invite you to join us by walking, running or skipping the 5K. The Jingle Bell run is the longest- standing festive race around and 100 percent of your registration fee and fundraising efforts benefit arthritis research. The registration fee is $50 dollars and includes a performance shirt, timing chip and bells for your shoes. Children are welcomed with a registration fee of $20 which includes a performance shirt, jingle bells and a Reindeer Dash mini race! Scherzer will also have “Scherzer 2017 Jingle Bell Run” shirts and breakfast goodies for everyone who sign’s up. If you find that you cannot attend the race you can “Jingle in Your Jammies” Choose this option and for $30 you receive a shirt and fundraise for a cure! Gather your family, friends and co-workers for a truly fun and festive 5K. Donations are also appreciated. Your gift will make an impact and help find new and better treatments – and a cure for arthritis. Follow the link below and be a part of the Scherzer Team! 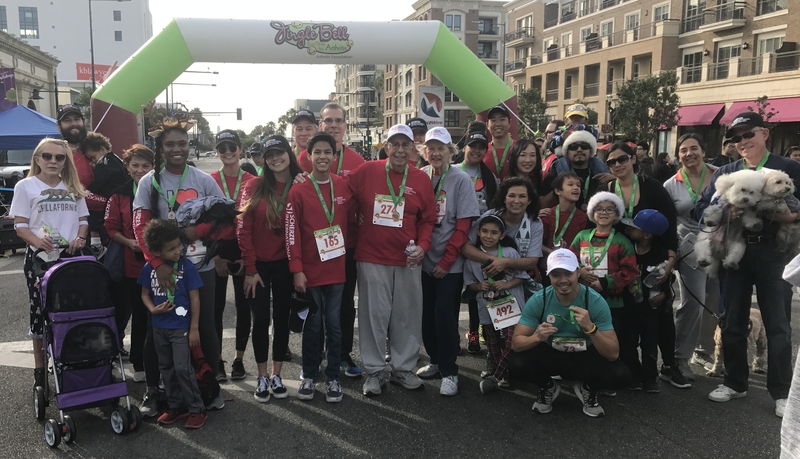 Jingle all the way to the finish line with us on Sunday, December 10, 2017 at Glendale Central Park where festivities begin at 8:00 a.m.
Let’s jingle all the way to find a cure for Arthritis! “Ban-the-box” measures, which generally prohibit employers from inquiring about a candidate’s criminal history (including performing background checks) until later in the hiring process, and impose significant compliance requirements, will soon be the norm rather than an exception. The list of localities that have enacted such legislation is growing fast and now includes Austin, Baltimore, Buffalo, Chicago, Columbia – MO, Los Angeles (enforcement started July 1, 2017), Montgomery County – MD, New York City, Philadelphia, Portland, Prince George’s County – MD, Rochester, San Francisco, and Seattle, and ten states (Connecticut, District of Columbia, Hawaii, Illinois, Massachusetts, Minnesota, New Jersey, Oregon, Rhode Island, and Vermont (effective July 1, 2017)). Although not labeled as “ban-the-box,” California’s Department of Fair Employment and Housing regulations (the “Regs”) that went into effect July 1, 2017 impose certain similar requirements when employers consider criminal history information in employment decisions. As reported in our previous blog, the Regs are substantially based on the enforcement guidance issued by the Equal Employment Opportunity Commission in April 2012, and prohibit employers from using a candidate’s criminal history in personnel decisions if such information will have an adverse impact on individuals that are in a legally protected class. Nearly two years after the enactment of New York City’s Fair Chance Act (FCA), and without much fanfare, the City’s Commission on Human Rights published its amended rules that establish certain definitions and procedures, and clarify the comprehensive requirements of the FCA when using criminal history in employment decisions, and considering applicants for licenses, registrations, and permits. Eleven states (California – AB 22; Colorado – The Employment Opportunity Act; Connecticut – SB 361; District of Columbia – Fair Credit in Employment Amendment Act, Hawaii – HB 31 SD1; Illinois – HB 4658; Maryland – HB 87; Nevada – SB 127; Oregon – SB 1045; Vermont – Act No. 154 (S. 95); Washington – RCW 19.182 and RCW 19.182.020) and at least two localities (New York City – Stop Credit Discrimination in Employment Act, and Philadelphia – Bill No. 160072), have enacted laws that generally prohibit private employers from checking a candidate’s credit history, except in circumstances where a credit screen is justified by the position’s responsibilities or is required by law. Pay equity initiatives, which among their provisions include a ban on inquiries about a candidate’s wages, are gaining momentum nationwide. The following jurisdictions have enacted such laws and many more are considering similar measures: Delaware – HS1 (effective December 14, 2017); Massachusetts – Pay Equity Act (effective July 1, 2018); New York City – Intro 1253 (effective October 31, 2017); Oregon HB 2005 (effective December 1, 2019); Philadelphia – Fair Practices Ordinance: Protections Against Unlawful Discrimination (set to go into effect May 23, 2017 but now facing a legal challenge); Puerto Rico – Equal Pay Act (effective March 8, 2017); and San Francisco – Parity in Pay Ordinance (effective July 1, 2018). Pending before California’s Senate is AB 168 that would prohibit employers from seeking an applicant’s salary history and impose significant penalties for violations. Notably, California already has a pay equity law, AB 1676, and although the law does not ban salary history inquiries, it does prohibit employers from using a candidate’s prior wages as the sole basis to justify a pay disparity. The USCIS released a revised version of Form I-9, Employment Eligibility Verification on July 17, 2017. Employers can use this revised version or continue using Form I-9 with a revision date of “11/14/16 N” through September 17, 2017. Beginning September 18, 2017, however, employers must use the new form (with the revision date of “07/17/17 N”). attempt to re-investigate or re-verify a candidate’s authorization to work using an unfair immigration-related practice.